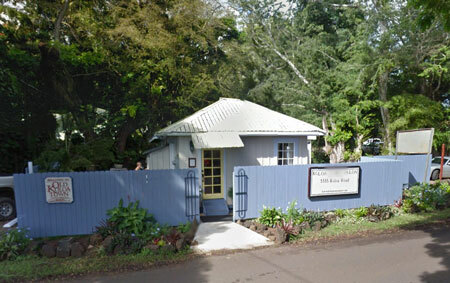 The Telephone Exchange was in the small building on the north side of Kōloa Road, opposite the existing Chevron station. The first telephone was installed on the island in 1880 by George N. Wilcox to link Dr. James Smith, the only physician on the island, to Lihuʻe. The system was extended in Lihuʻe and elsewhere but did not reach other residents of Kōloa, the hospital/dispensary and plantation officials until 1900. During the thirties telephones were still rather rare in town and nonexistent in the worker camps. Radio telephone service to the other islands and the mainland was available from the Kōloa exchange in 1931. The exchange closed in 1948 and is now a modest Spa/Salon.